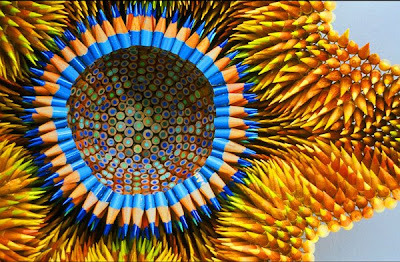 I have only recently discovered the art of Jennifer Maestre. 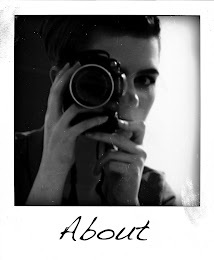 Her work has a very tactile quality. 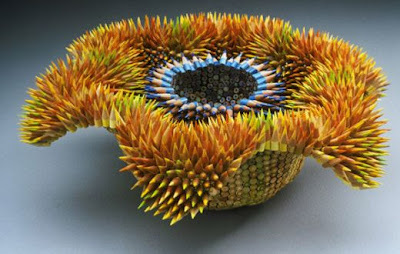 The main media used in these pieces are simple everyday objects: Pencils. 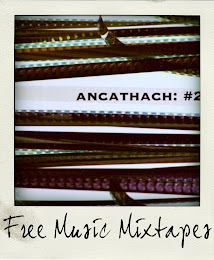 Almost frugal materials that take on a new life when used in her work. Jennifer Maestre was born in Johannesburg, South Africa but is currently based in the US. She uses hundreds of pencils, cuts them into 1-inch sections, drills a hole in each section (to turn them into beads), sharpens them and then sews them together. Maestre explains "My sculptures were originally inspired by the form and function of the sea urchin. The spines of the urchin, so dangerous yet beautiful, serve as an explicit warning against contact. 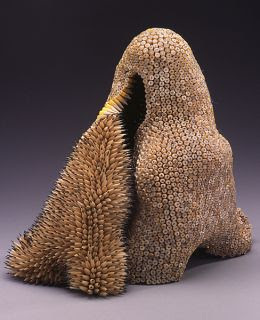 The alluring texture of the spines draws the touch in spite of the possible consequences. The tension unveiled, we feel push and pull, desire and repulsion. The sections of pencils present aspects of sharp and smooth for two very different textural and aesthetic experiences.Paradox and surprise are integral in my choice of materials. Quantities of industrially manufactured objects are used to create flexible forms reminiscent of the organic shapes of animals and nature. 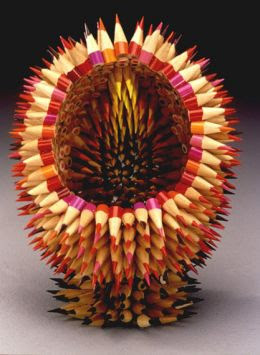 Pencils are common objects, here, these anonymous objects become the structure. There is true a fragility to the sometimes brutal aspect of the sculptures, vulnerability that is belied by the fearsome texture."